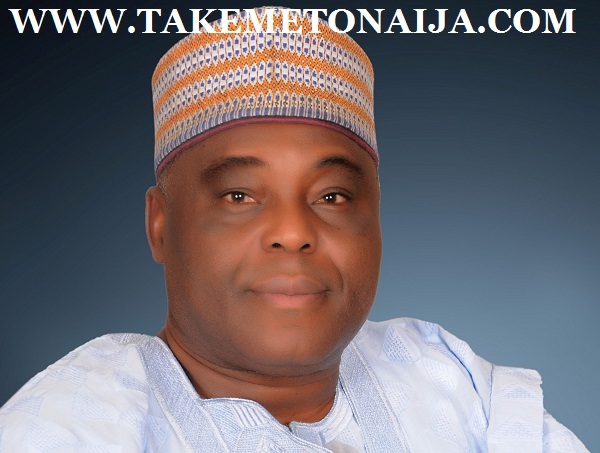 Raymond Anthony Aleogho Dokpesi is a Nigerian media businessman, . He entered the Nigerian mass media industry with his company Daar Communications and set-up the Nigerian TV network Africa Independent Television or AIT. He was the organising committee chairman of the Peoples Democratic Party national conference in 2015. Dokpesi hail from Agenebode in Etsako East Local Government Area in Edo State of Nigeria.He attended Ebenezer African Church School, Ibadan, Loyola College, Ibadan and Immaculate Conception College, Benin City. He worked briefly with the Nigerian Ports Authority as Marine Office Cadet in 1969 before proceeding to Poland for further studies. He attented Wyzsza Szokta Morska Gdynia and University of Gdansk Sopot for his Bachelor, Masters Degree and Doctorate Degrees. He made a first class with distinction and was also the best graduating student in fifty years in Poland in Marine Transport Engineering. He lectured in the University of Gdansk, Poland as Assistant Lecturer in Marine Transport Economics before proceeding to Nigeria on the invitation of the then, Nigerian Head of State who was on State visit to Poland. While schooling, he held the following positions; President, Nigerian Students Union Gdansk Poland (1972 – 1974), President, African Students Union, Poland (1973), President, International Students Association, Poland (1974), President, Nigerian Students, Eastern Europe (1974). In the early 1990s, as a result of the historic National Broadcasting Commission decree, according to Muyiwa Oyinlola (2004) Nigerian media was dominated by the government only. Information was only made possible from government owned broadcasting firms. However, the Head of State then General Babangida, issued another decree which allowed private broadcasting in Nigeria. After this decree came the first private television network in Nigeria, Africa Independent Television (AIT). AIT was pioneered by High Chief, Dr. Raymond Dokpesi, and was also Africa’s first satellite T.V. station. Today Dokpesi is regarded as the media guru of Nigeria. Some also refer to him as the Ted Turner of Nigeria. Dokpesi not only pioneered the first satellite TV but also the first privately owned radio station in Nigeria. According to the journalist Kolapo (2006), Raymond claims that AIT set the standard for salary structure in the media industry in which Nigerian Television Authority imitated. He worked with the Federal Ministry of Transport and Aviation as the Head of Water Transport Division on Secondment from Nigerian Ports Plc (NTCC) between 1978 – 1983.
operator of the first Independent Radio Station in the Federal Republic of Nigeria, RayPower , Africa Independent Television (AIT); the first Afrocentric Global Television Station,DAARSAT,a fully Nigerian based DHTV and DAAR Investment. High Chief Aleogho Dokpesi’s remarkable role in broadcasting in the federal Republic of Nigeria apart from pioneering private radio and global satellite broadcasting, he also revolutionized the sector through the introduction of 24 hours transmission on both radio and television right from inception, introduction of cyber and chroma technology for television operations and digitalized audio and video signals on both radio and television. Through his efforts Africa Independent Television (AIT) became the first African broadcast station to transmit from and into the United States of America (USA). To his credit and exceptional scholarship prowess are the following publications: Optimal size of Tankers for International Trade (1974), West African Shipping Range (1975), Technology Change in Shipping and its impact on Ports (1976), Consultation Machinery in Shipping – The West African Experience, International Multi-modal Transport System – Implication on Nigeria Economy (1980), Thoughts on Nigeria National Shipping policy(1980),Fiscal and Financial Arrangements to Encourage Investment in Shipping in Nigeria (1986), Security in Cargo Handling – The Nigerian Experience Bulk Fleet Development (1986), The Issue of a Shipping Agency in the Maritime Industry (1987), The role of the Seaport in the Structural Adjustment Programme, Problems of Liner Shipping Policy and the review of the United Nations Convention on a Code of Conduct Linear Conferences – Present Status and Prospects (1991). He is a fellow of several professional and management institutes: the Nigerian Institute of Shipping, Chartered institute of Transport, Institute of Transport Administration, Nigerian Institute of Management, Nigerian Institute of Public Relations and the Institute of Directors. The following are some of the National Assignments that he had been called upon at various times to perform for the Federal Republic of Nigeria: Member – Presidential Committee on Long Term Measure to solve Piracy and Security Problems in Nigerian Sea Ports and Territorial Waters (1981), Member – Chief of Defence Staff Board on Boarders and Harbor Security Force (1982), Member – Committee on Decentralization of Nigeria Ports Plc (1983), Member – Shipping Policy Implementation Committee (1987). He is a recipient of several national and international awards amongst which are: Dr. Kwame Nkurumah Africa Leadership Award and Gold Medal for Excellence in Business Practice, awarded by the Foundation for Excellence in Business Practice, an organ of the United Nations based in Geneva, Switzerland. He is also the recipient of the prestigious Institute of Directors (10D) 2007 Entrepreneurial Award. He holds the following chieftaincy titles: Ogieorumoa of Weppa Wanno – 1986, Araba of Osooroland 1987, Osese of South Uneme – 1990, Gbobaniyi of Ilawe-Ekiti-1994,Oganigwe Umu Orji Ako Nibo-1999, Sardaunna of Kpaduma, Abuja 2002 and Ezomo of Weppa Wanno Land, 2003. He is a member of Island, Ikoyi and Apapa club. He is an avid reader, researcher, philanthropist and humanitarian. He also loves sports, traveling and music. DOKPESI is happily married with children. Dokpesi also has his hands in politics. One of his first political assignments was as a political campaign manager for the Alhaji Bamanga Tukur, which saw Tukur into the then Gongola state government house. He also assumed the same role during Alharji Adamu Ciroma presidential campaign, and Alharji Bamanga Tukur’s presidential campaign in 1993.Likewise during Peter Odili’s presidential campaign. Dokpesi was one of the leaders of the South-South People Assembly (SSPA) an organisation that seeks to promote south-south people of Nigeria. Raymond Dokpesi has built schools for community and also offered scholarships to prospective students into tertiary institutions. On November 11, 2015 Dokpesi, on behalf of the PDP party, made a public apology due to the mismanagement of Nigeria under the PDP governments. He also criticised the PDP for fielding Jonathan Goodluck as the PDP’s presidential candidate in the March 2015 elections. On December 9, 2015, Dokpesi and his company, Daar Holding and Investment Limited, were charged in the Federal High Court, Abuja in a $2.1bn money laundering scam. The money was budgeted for weapons procurement for the Nigerian military to fight against the Boko Haram militants, but was allegedly diverted by Dasuki Sambo, the then National Security Advisor, to Dokpesi’s Daar Holding and Investment Limited. The court charges marked “FHC/ABJ/CR/380/2015” and filed by the Economic and Financial Crimes Commission (EFCC) indicated that they are accused of violating the Money Laundering Act, the EFCC Act and the Public Procurement Act. The presiding judge, Justice Gabriel Kolawole, remanded Mr. Dokpesi EFCC and adjourned the trial until February 17th.